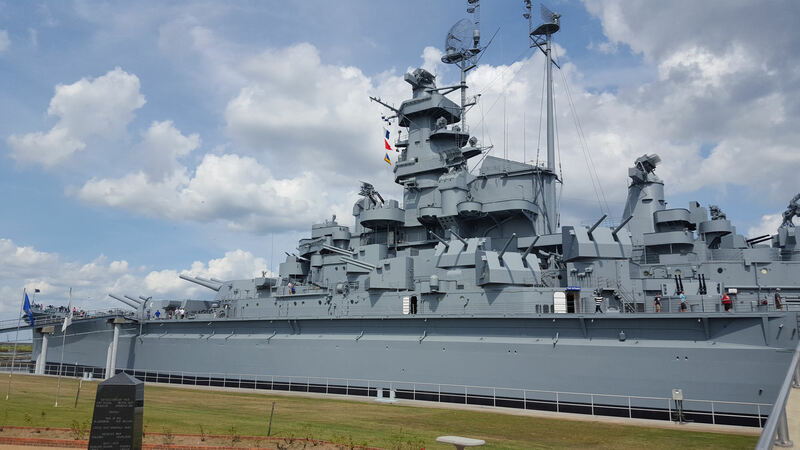 2015 Road Trip Photos #38: Battleship! « Midlife Crisis Crossover! 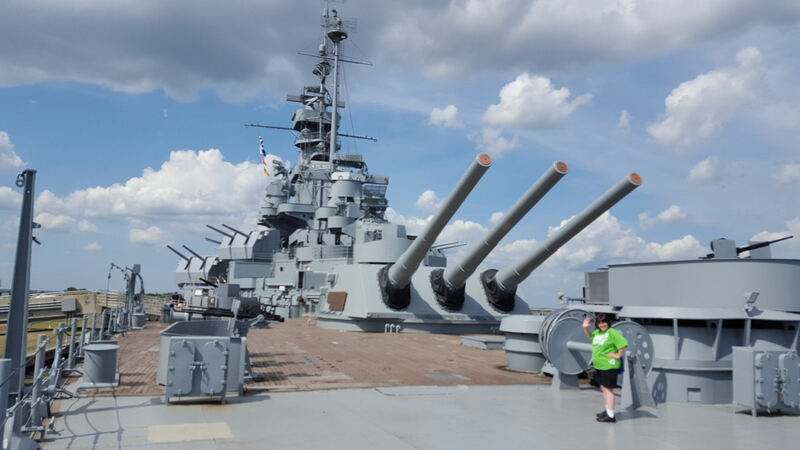 2015 Road Trip Photos #38: Battleship! In game, you sink Battleship. 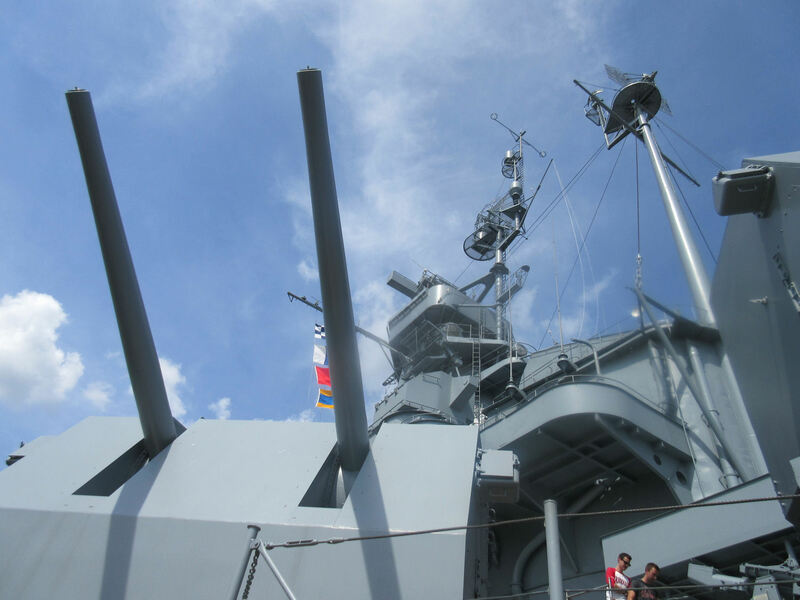 In real life, battleship sink YOU. After lunch, Day 5 saw us heading east along the Gulf Coast, back into the state of Alabama, slowly through the city of Mobile in congested traffic, and down to the shore of Mobile Bay, where they’ve docked the kind of enormous boat that would’ve been a big help against Jaws if it would’ve fit anywhere near Amity’s beaches. Welcome aboard the U.S.S. Alabama. 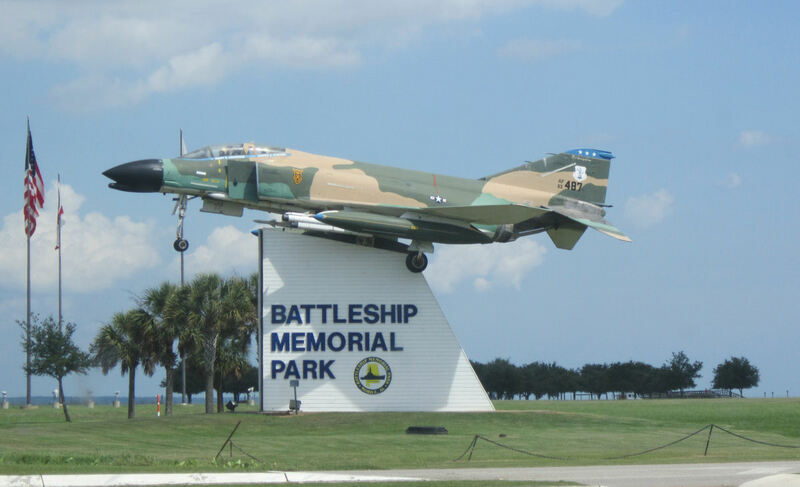 Our destination (after one wrong turn) was Battleship Memorial Park, where a collection of military planes and other vehicles in much the same manner as we saw at the National WWII Museum in New Orleans, though not limited to WWII in this case. An F-4C Phantom perched atop their sign points the way. 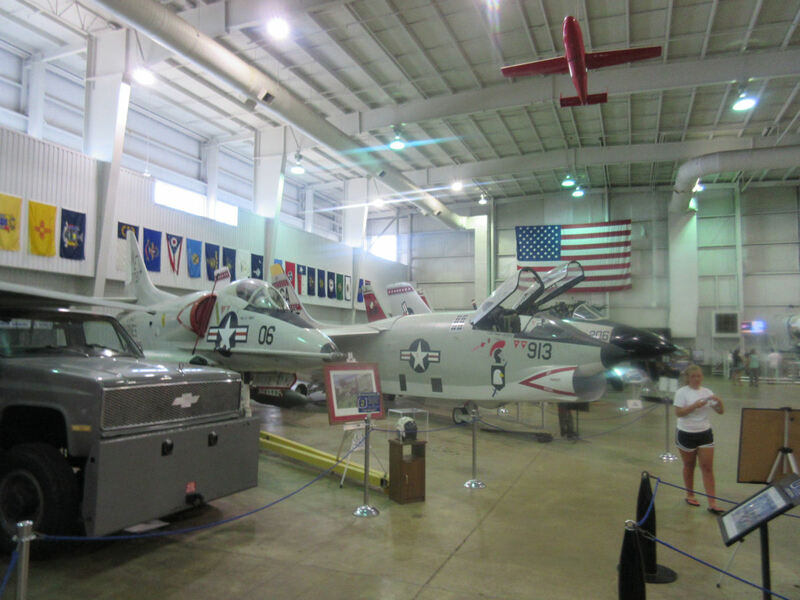 Over two dozen vehicles are positioned around the parking lot and inside their Aircraft Pavilion. The B-52D Stratofortress was used primarily for bombing Vietnam. The formerly top-secret, supersonic A-12 Blackbird now out in the open. 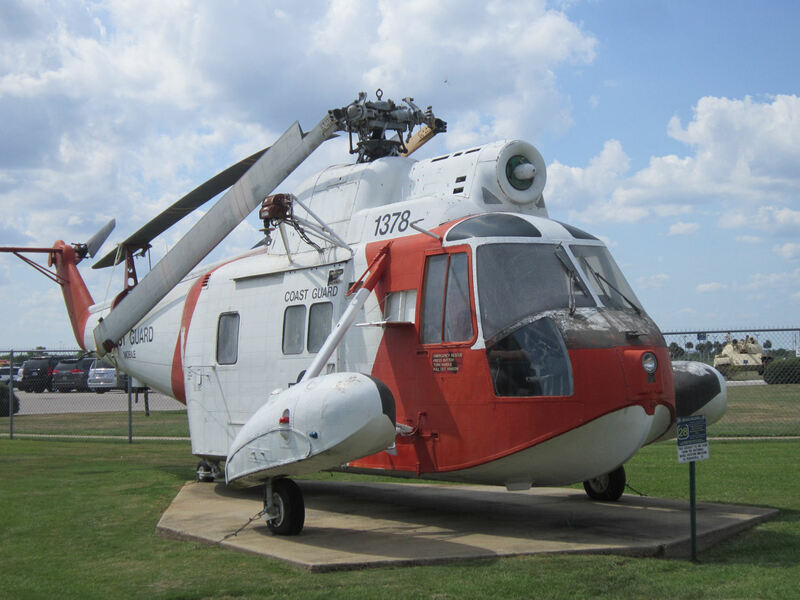 The HH-52A Sea Guardian, one of the Coast Guard’s old helicopter models. But the main attraction is indisputably the Alabama. This shot was the closest we came to capturing the length of the boat in a single shot. The Alabama launched in 1942, served in both the Atlantic and Pacific fronts during WWII, and was decommissioned in 1947. 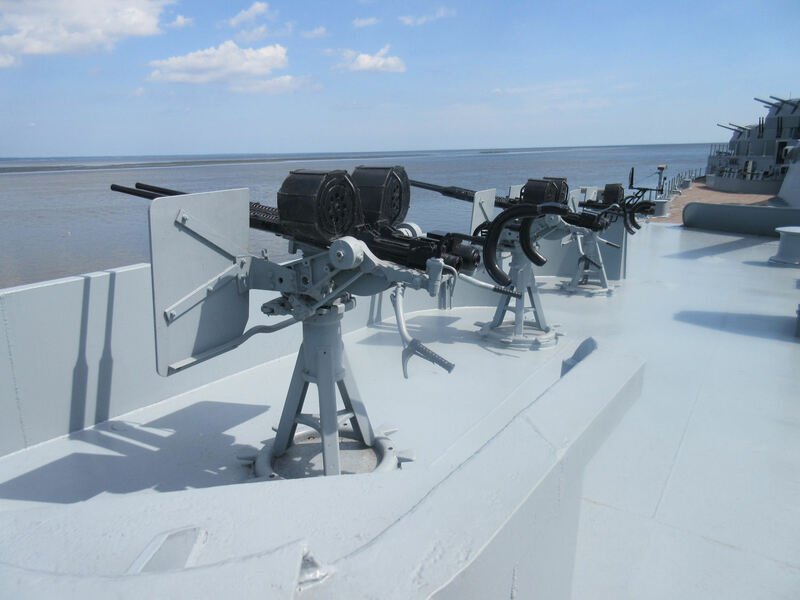 After sitting in a naval yard for a good while, after some fundraising efforts it was eventually relocated to its present position in 1964 and opened as a gargantuan museum piece in 1965. 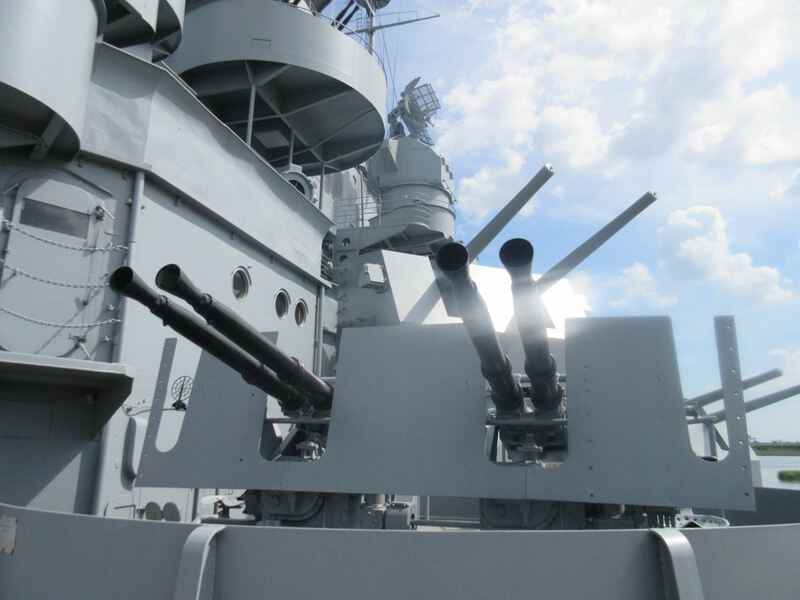 In addition to the museum and the Aircraft Pavilion, visitors can board the Alabama itself, wander a select number of decks, and see its arsenal up close. Lots and lots and lots and lots of guns in turrets or standalone, all in assorted sizes — small, medium, large, and Big Gulp. 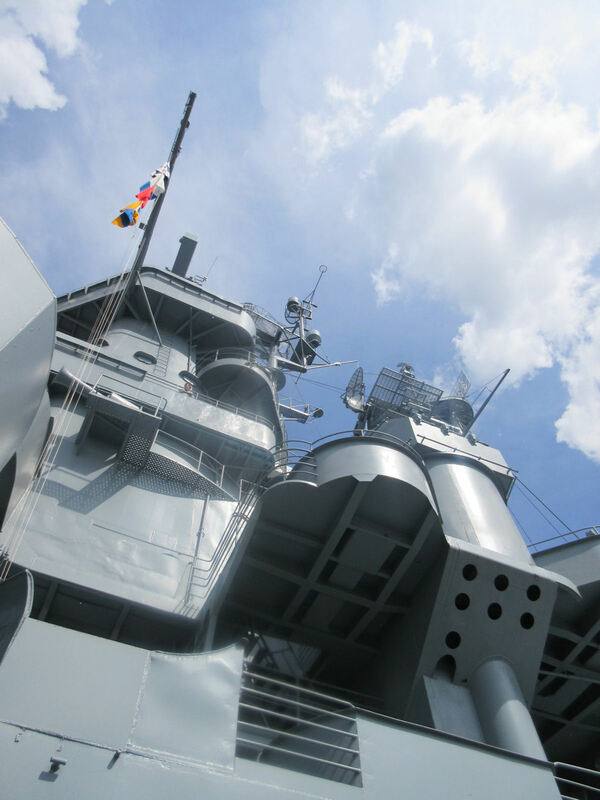 Several rooms inside the main decks contain displays of wartime memorabilia, photographs, uniforms, videos, and not nearly enough fans to keep those not-so-ventilated metallic rooms cooled down in the sun’s blistering summer bake-off. The more we walked around inside, the more we cooked. We felt the burn and then some once we got to the part of the path with metal ladders in it. 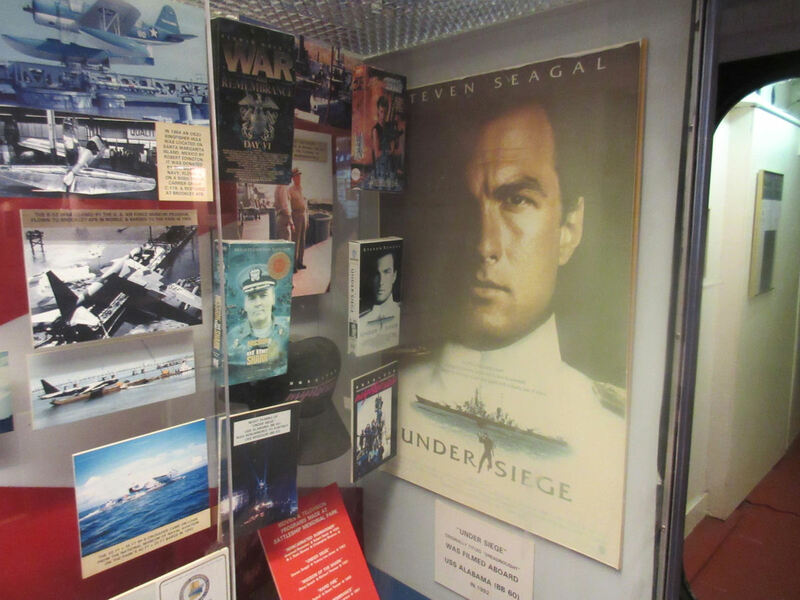 Of peculiar interest to people like me: one room commemorates the numerous Hollywood productions that have used the Alabama as their setting. Among the most famous was the greatest Steven Seagal flick of all time, the kinda-not-bad “Die Hard on a boat” adventure Under Siege, costarring Academy Award Winner Tommy Lee Jones and reality TV oddball Gary Busey. (From the director of The Fugitive! 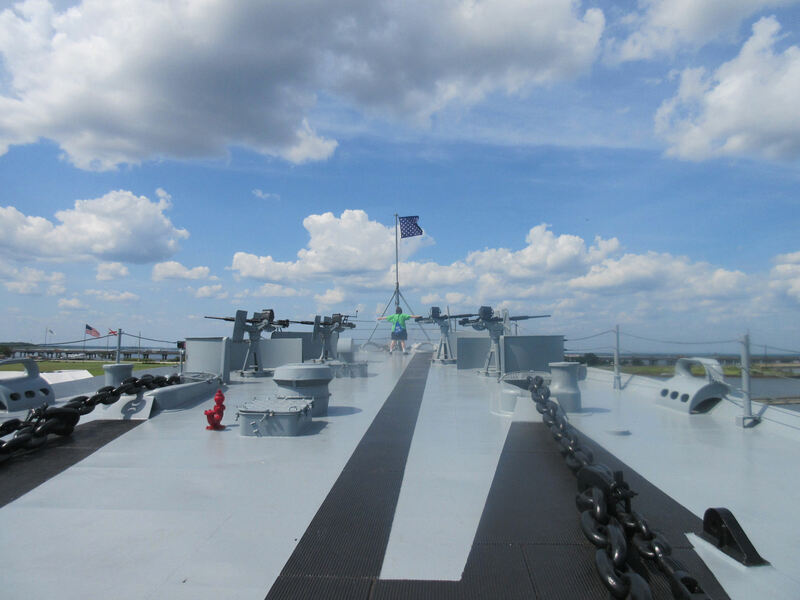 Shortly before our arrival, the Alabama had shot its next appearance as the titular ship from the upcoming Nicolas Cage vehicle U.S.S. Indianapolis: Men of Courage, costarring Tom Sizemore, Thomas Jane, and voice actor Matt Lanter, a.k.a. Anakin Skywalker from Star Wars: The Clone Wars. Ostensibly due out in some form in 2016 from Mario Van Peebles, the director of Ali and New Jack City. So hopefully that’s properly interesting. Once you’re done with the easily accessible decks, you can make a game of seeing how many levels you can climb up through the ship until you’re stopped in your tracks by acrophobia, heatstroke, or locked doors. 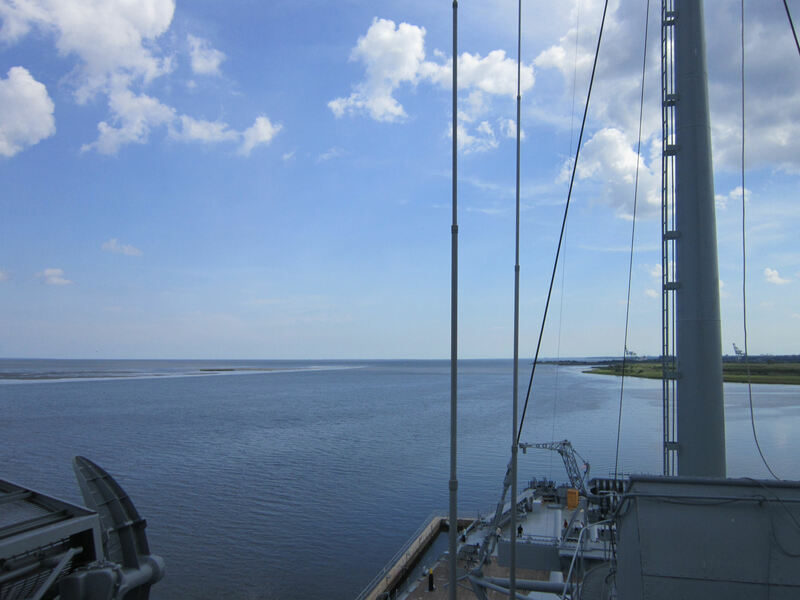 …and of splendid Mobile Bay. Too bad we couldn’t feel a single ocean breeze up there. And of course it wouldn’t be a walk around a large water vessel without one of these moments. Anne, Queen of the World. …and then we descended all those dizzying levels, got lost once or twice in the labyrinthine interior, eventually found our way back to the gangplank, traversed back to the museum, and immediately asked for all the drinking water. 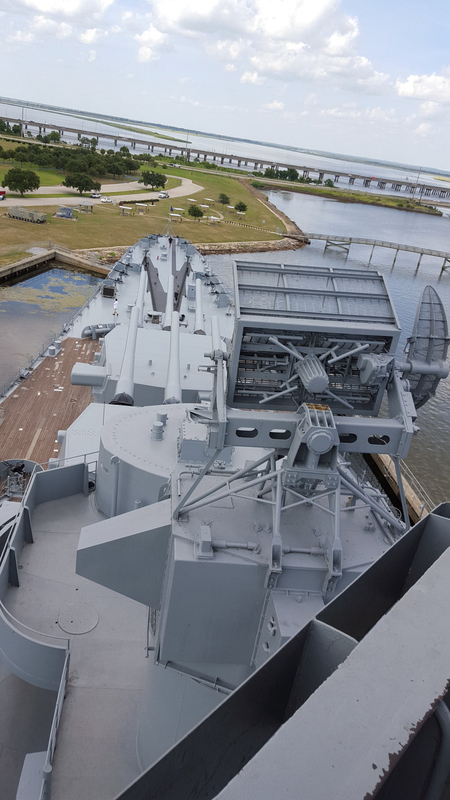 And for those who’ve been following along with this road trip series and collecting Hurricane Katrina stories: this 680-foot-long battleship, weighing nearly 80 million pounds, withstood Katrina but was left listing eight degrees to port. Several employees’ families holed up inside for days, even driving their cars up the gangway and parking inside. They fared better than the Pavilion, which took extensive damage and had three aircraft demolished. The park reopened about four months later, much sooner that most other local businesses could say. « Introducing the MCC Rerun Smiley! You should of made a stop at the beautiful beaches of Gulf Shores Alabama. 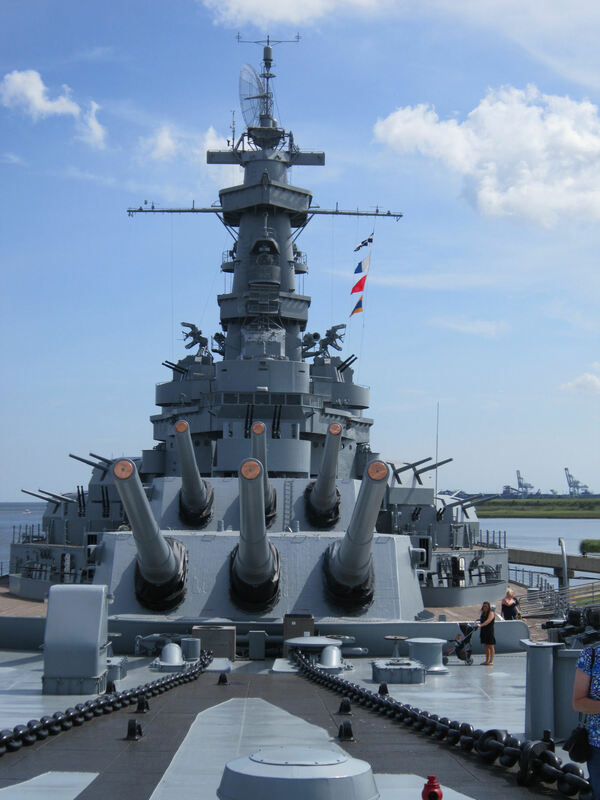 Not far from the USS Alabama! That is where I live. Now that you mention it, a coworker suggested the Gulf Shores to me too. Unfortunately he didn’t think of it till three days before takeoff. By then we had such a big to-do list already piled up that I didn’t have time to add any more to it. Despite our successes on this vacation, we missed so many sights in Alabama that my wife and I agree a return trip is in order someday, and the Gulf Shores would definitely be on that itinerary.